Carry These New Books with You Wherever You Go. by ABC. March 12 2015. Jodhi Meares casts world's first female-male model for The Upside's women's range. By Jenna Clarke, photography by Jez Smith. 28 June 2015. Meet Casey Legler, the woman who exclusively models menswear. by Julia Frank, photographed by Jez Smith. 29th Jun 2015.
by Erin O’Dwyer. July 13 2015. Daytime Emmy nominated! The annual Out100 is filled with the LGBT community's biggest movers and shakers. In this special, we sit with 12 of 2013's most outstanding featured men and women. 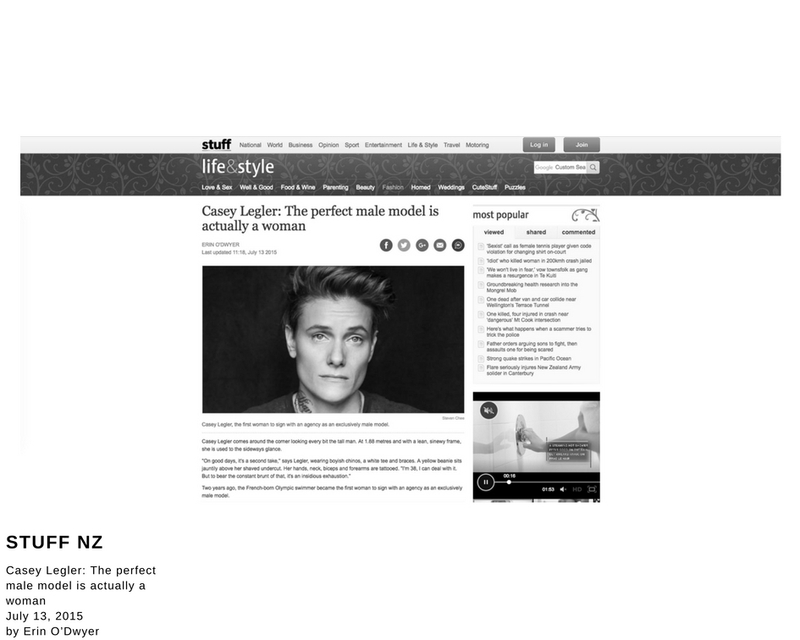 Casey Legler is an artist, a former Olympic swimmer and now a male model. She describes her entry into the fashion world and why the industry is allowing for a unique moment to happen. Hear Olympian Casey Legler explain how she became the first woman to be signed exclusively as a male model.